We had a very good meal the other night at Bonefish Grill with great food and great service. The only real misstep of the meal was mine--I forgot my "good" camera and had to rely on my iPhone for a few photos. They really do not do the great food justice. Well, that will be an excuse to go back again another time! I used the web to reserve a table for later that evening. What a nice service, and it's a good thing I did--the wait when we got there at 7 PM on a Saturday evening was about 45 minutes for walk-ins. But we were led right to our reserved table. how nice was that? I was very happy to see a nice beer and wine selection, including a number of craft beers, a very nice touch. Of course I had to try one! We started with appetizers. 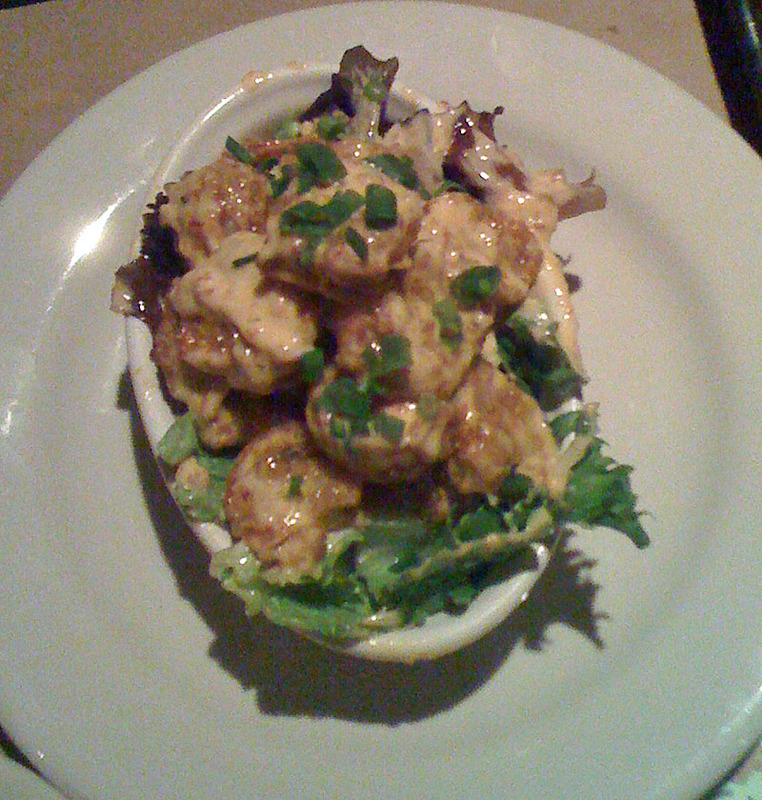 First up was the Bang Bang Shrimp, medium shrimpt that were breaded and deep fried, then tossed in a spicy, creamy sauce. And they were very good. The sauces had a nice gentle heat, but you certainly knew there was some heat there. And the shrimp were cooked just right. I could have eaten a whole plate of these babies. handmade potstickers with American-style Kobe beef. They were pan-seared with crispy shallots, Thai peppers, and soy sauce. They were also quite good. I could have eaten a mound of these as well. Very good dish. Next it was time for my salad. The salad was nice and cold, refreshing and fresh. Everything a salad should be. It included a bit of heart of palm, a nice touch. But finally it was time for main courses. My friend Tommy had the Sea Scallops and Shrimp Dinner, served with Parmesan Mashed Potatoes and Vegetable Medley. I had a scallop and a shrimp. The scallop was as soft as warm butter and literally melted in my mouth. OMG, these were cooked perfectly. The shrimp was equally well done. This was very successful dish and the portion just right, given the apptizers we'd previously had. For my dinner I had the Fontina Chop, a boneless pork chop that had been grilled to juicy perfection, topped with fontina cheese along with a garlic, prosciutto and mushroom marsala wine sauce. It was absoltely excellent. The pork was cooked well and tender and juicy. The fontina added a nice note and the marsala sauce was great. 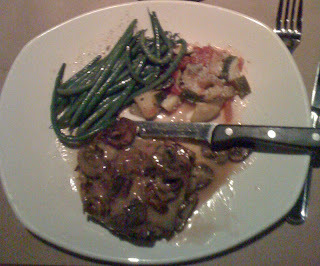 It was served with haricot verts and a vegetable medley, both of which were equally good. Our server was Ryan and he did an excellent job of taking care of us. We had a great dining experience. I only wish I'd taken my "good" camera to have done justice to the great meal we had. It was excellent. I will be back! We ate at Finesse again recently. Having already had dinner and lunch there, each a very good experience, now it was time to try brunch to see if we could equal those previous experiences. Oh yeah, we did! We arrived right around noon on a Sunday to find a fairly busy restaurant. I was glad to see the place pretty busy. There were two large parties of a dozen or more there, as well as quite a few smaller groups. The place seemed festive and alive. We were promptly greeted and seated. I was happy to find that our waiter was Dimitris, the efficient and pleasant young man that waited on us for lunch a few weeks back. 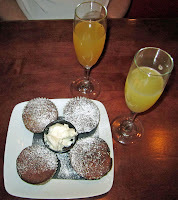 We quickly had our drink orders taken, a Bellini and a Mimosa--the first one is free at Sunday Brunch--can't beat that price! 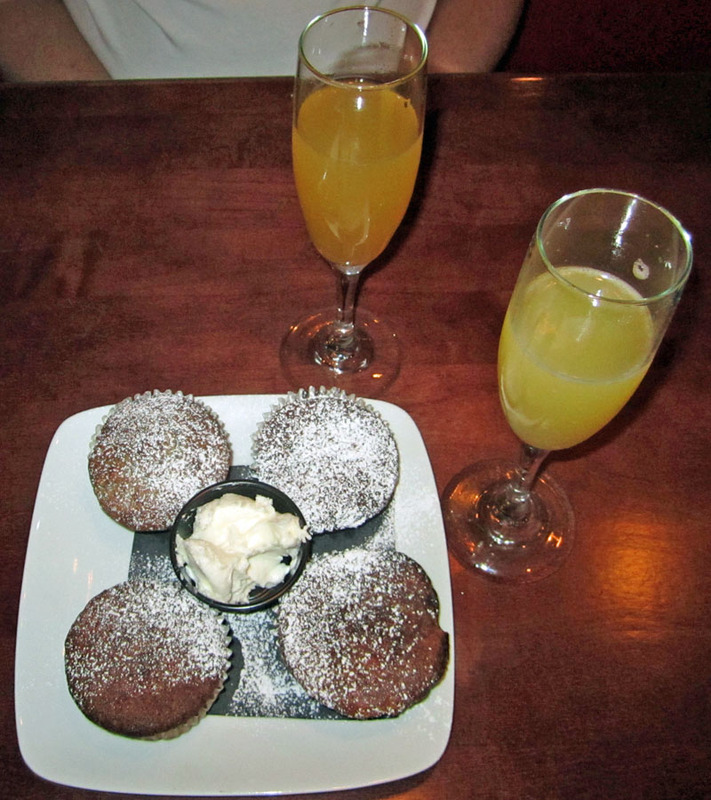 We were only sitting a few minutes when some warm Banana Muffins were placed before us--what a nice treat. Oh, and not only did they look good, they were wonderful. They were moist and rich and heavy with good taste. The top of the muffin peeled right off and had a rich and caramely flavor--it was reminiscent of a gooey fudgy brownie in consistency. It was a very good muffin, no doubt. I was hungry and so had big eyes. 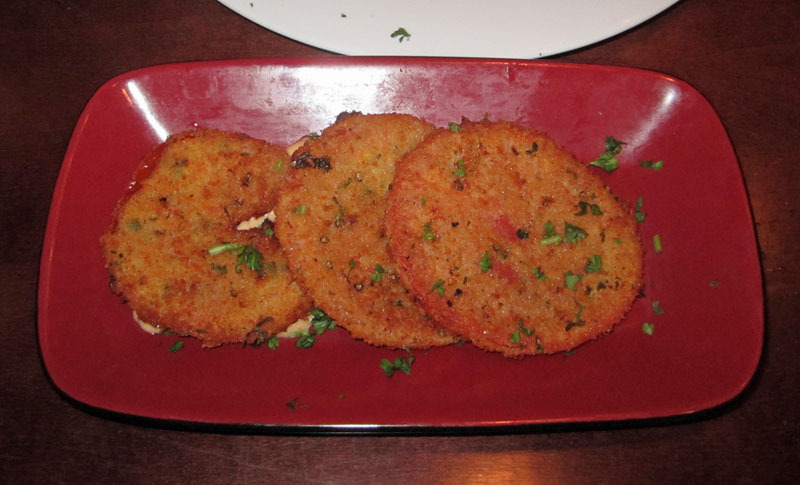 We started with a side of the Fried Ripe Tomatoes--three slices of ripe tomatoes had been pamesan and peppercorn breaded and deep fried, then placed on a bit of chipotle aioli. I would have liked just a bit more of the aioli, but the dish was excellent. I was surprise that the tomatoes could be so good and not be overly mushy as you'd expect from a ripe tomato. 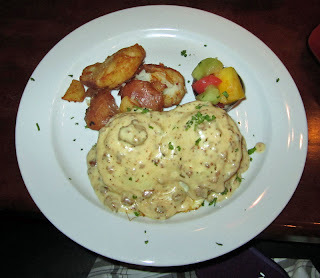 Being hungry, I ordered another side, and this one was quite a surprise to me: Biscuit N Gravy. Now, that may sound somewhat ordinary to you, and I love my biscuits n gravy. But this was not ordinary. I thought I made the sausage gravy ever, but I see I have some serious competiton here. Actually, i must cede victory, because this sausage gravy was the best I've ever had. It was velvety and creamy and rich, and was exceptionally well-seasoned. I think I could have poured it in a glass and drank it, it was that good. Outstanding! 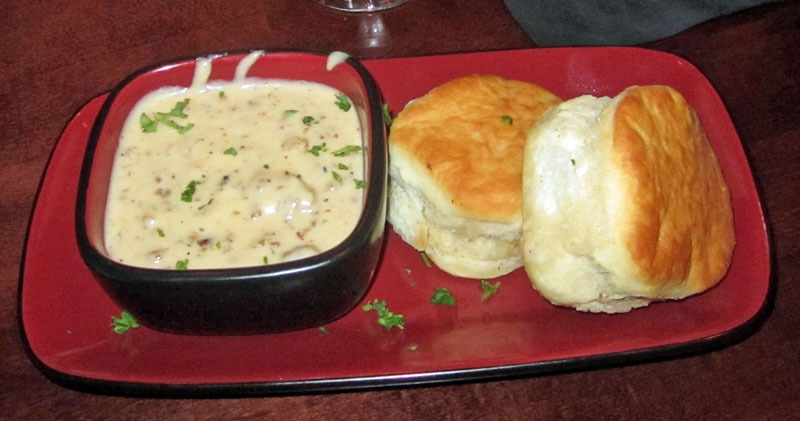 The biscuits were good too, but the real star was the gravy. 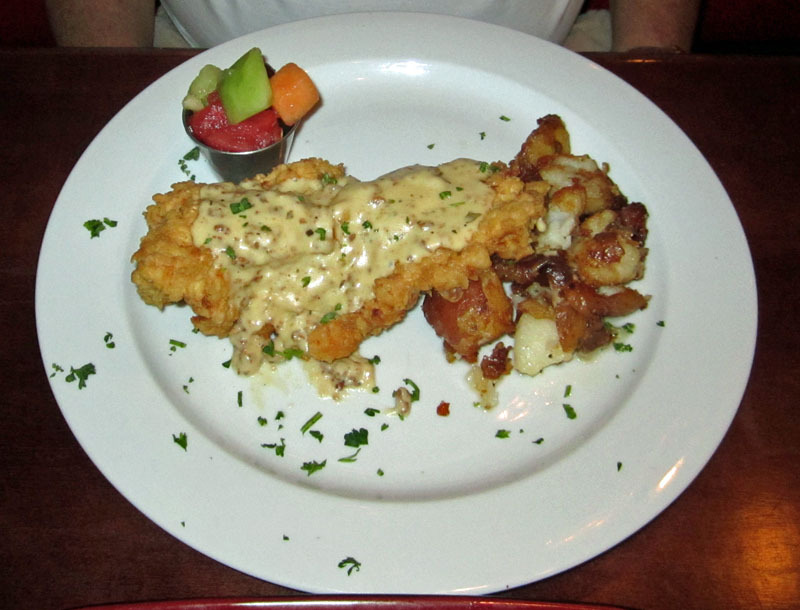 My friend Tommy ordered the Country Fried Chicken--a boneless chicken breast that had been nicely and lightly breaded and fried, then topped with some sausage gravy (how can you go wrong with that combination). It was served with some Breakfast potatoes and some fruit. The chicken itself was extraordinarily tender and juicy. The breading was light and crispy. It was absolutely excellent. Tommy managed to finish the whole thing. Of note on both our plates were the breakfast potatoes--chunks of potatoes that were well cooked, yet crispy on the outside, but not greasy. I am not sure how they were prepared, but they had a great flavor. Tender and just a bit crispy, nicely seasoned, they were wonderful. For my main selection, I chose the Country Benny. A buttered biscuit was topped with a sausage patty and a slice of tomato, then a fried egg (over easy) and finally sausage gravy--and there were two of these on the plate. It was fantastic. Wow, what a boatload of flavor. Of course, the sausage gravy was killer, but all the flavors really went well together. This was a killer breakfast item. Fortunately I was hungry and ordered a lot, so i had some of this to take home for later--I polished it off that same night. It was accompanied by the same breakfast potatoes and a bit of fruit. During the course of our meal I noticed Chef/Owner Autumn in the dining room, assisting guest, and checking up on people She came by our table a few times to make sure we had everything we needed. Towards the end of our meal, now that we'd had the food and dined anonymously, I gave her my card and asked if I could meet Chef Alex. He came out and was extremely gracious. We had a nice little chat about the food and the restaurant and how it all came to be, and we also got to meet their little daugter, Bella--this place is truly a family affair. 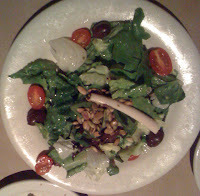 Through the whole course of our meal, or service (thank Dimitris and the rest) was very thorough, prompt, and attentive. But the real star was the food. This was my third time eating at Finesse and each time has been a great experience. I think that if they stay on the same course, good things are coming their way. I know I'll be back and would be happy to take guests here for a special occasion--or just for a good meal. 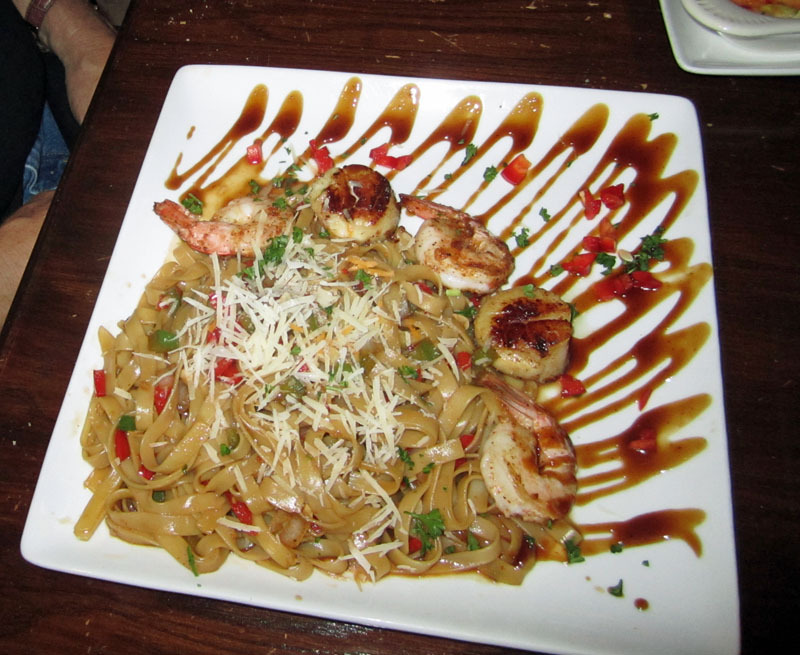 There are a lot of good places to eat in Lake Mary, but Finesse is among the very best of them. I highly recommend them yet again! We ate at Cafe Rouge again the other night, and again we were not at all disappointed. We've been here a few times and recently got to know the chef a bit, so he knew who we were when we entered. We were hungry, it was Friday night, and they were ready to serve us. We had quite a nice meal. We started out with some appetizers. First the Sam's Shrimp Jammer. These were a nice helping of bite-sized shrimp. They were fried and served in a spicy cream sauce. 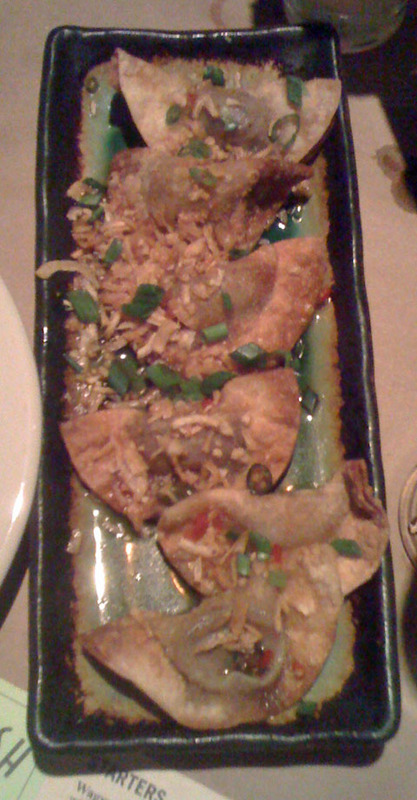 Now, for my money, they could have stood a bit more heat (as in spicy heat), but still they were pretty decent. Did I mention we were very hungry? 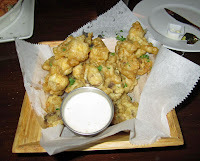 Well, to go with that, we also ordered the Hand Dipped Beer Battered Mushrooms. Now these were very, very good. They came out nice and hot and had a nice breading on them. The mushrooms themselves tasted really meaty and--well--mushroomy! They were served with a horseradish dipping sauce which only served to enhance their flavor. And they arrived at the table piping hot. A very, very good appetizer. Tommy decided to try the soup of the day Cream of Asparagus Soup. I have not always been a big asparagus fan, but in the last few years have learned to love it. I was curious how it would taste in a soup. Well, let me tell you, it was excellent. 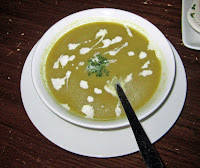 A nice creamy soup had a very mild asparagus flavor. It was delicious and I'd order it again. 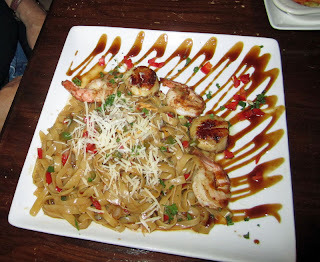 For his main course, Tommy ordered the Pasta Special-- a large portion of fettucini in a cream sauce was served with three shrimp and two scallops. 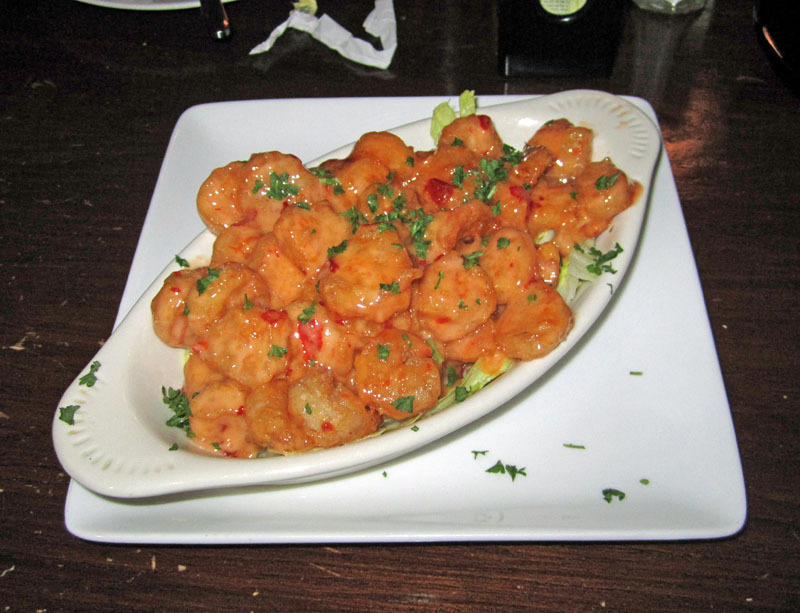 Now, the shrimp and scallops were cooked perfectly--just perfect. But the protein part of the dish seemed to be just a bit skimpy, give the huge portion of fettucine. 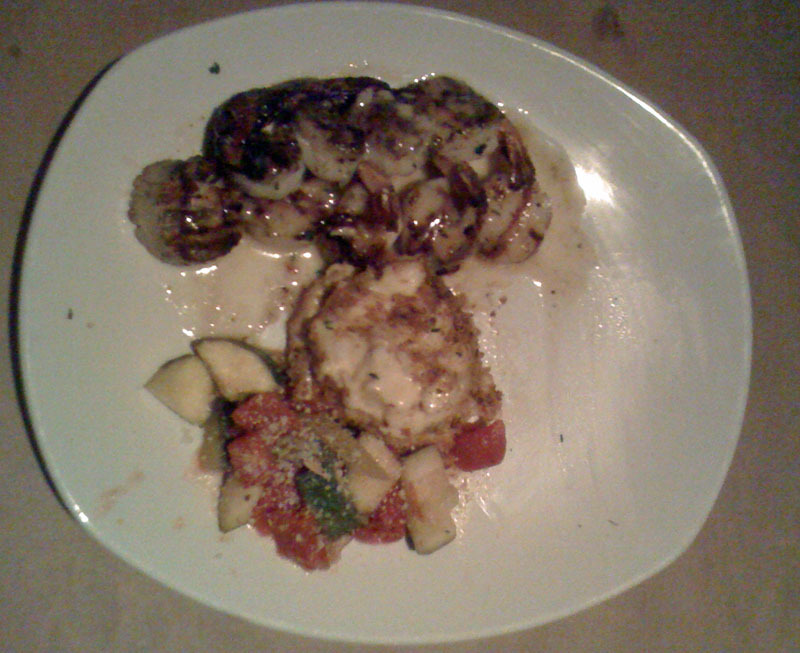 However, it all had a wonderful flavor and the presentation was very nice as well. Maybe one more each shrimp and scallop would have made the dish seem more of a value. Still, the taste was spot-on. 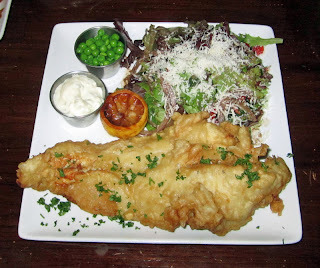 I ordered the Traditional English Style Beer Battered Haddock and Chips--minus the chips. Nothing against chips, but i substituted a salad for the chips--no problem. It also cam with a small serving of mushy peas, a grilled lemon half, and of course, tartar sauce. The salad was very good as were the peas. But what i really need to comment on is the fish. It was, without a doubt, the best piece of mild white fleshed fish I have ever eaten. It was a huge portion, first of all, and covered with a nice beer batter. But underneath that batter was a tender, moist, delicate, and delicious fish--so good that I ate it just as it was. It was fantastic. Best fried white fish I've ever had. The batter really protected it and kept it nice and moist. Good job. We have very attentive service through the course of our meal and I had a chance to watch the goings-on in the restaurant. Chef-owner Sam spent a nice bit of time chatting with us. At first I thought maybe it was just us, but as the time went on I found that he spent a lot of time all over the place--in the dining room chatting with guests, in the kitchen checking on things, and interacting with the other staff. I was impressed. It's attention to detail and a great span of control that can make or break a good restaurant, and Sam certainly was in charge of what was going on, but not at all obtrusively. I was impressed. When I think of good places to eat in downtown Sanford, of my favorites, Cafe Rouge is right near the top of the list. For value, it does top the list, second only to the pricier Stone's Throw. They seem to be doing a nice business at Cafe Rouge. I hope they stay on their game and continue their winning ways. I know I'll be back, for sure! I suppose the draw for Wall Street Cantina is the location in downtown Orlando, in the heart of what I guess is the "party district." But I would not go here just for the food, there is much better in Orlando. Still, the atmosphere is nice. On a recent Frida evening my friend Tommy and I stopped by and sat outside in the pleasant evening air. I had the Spicy Chicken Burrito. It was really very ordinary at best. Though billed as being filled with spicy chicken, black beans, corn, rice and spicy sour cream, it was not very spicy at all. Don't get me wrong, it was decent, but I can't really say it was Tex-Mex as billed. 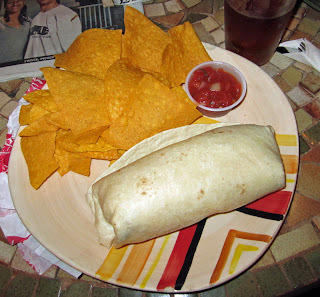 On top of that, the tortilla chips and the salsa was about as ordinary and plain as it gets, nothing special at all. The price was right at $7.99, but the food nothing special. Tommy fared a bit better with the Pork Loin Veracruz sandwich. 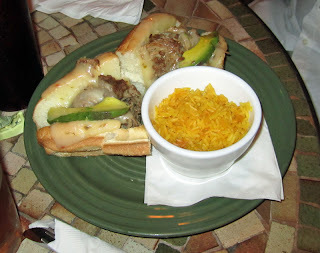 The roasted pork on a hoagie claimed to have chipotle sauce and chipotle mayonaisse, along with avocado and pepper jack cheese. But the chipotle flavor was mostly lacking. Still it was not a bad sandwich. The yellow rice served with it was pretty decent as well. Service during our meal was surely less than attentive. The waiter really didn't know all the beers they had available and was gone for what seemed long periods, especially when we were done eating and wanting our check. Not a bad experience, but definitely not the best. I've had much better food and service elsewhere, and next time that's where I'll eat....elsewhere.